They call it “a window on contemporary Arab culture.” London’s biennale Shubbak Festival brings together a multitude of new and unexpected voices from across the Arab world to large audiences in the English capital. This year 150 artists took part in the two-week festival (1-16 July) that offered dozens of events from visual arts, film, music, theater, and dance, to literature and debate. 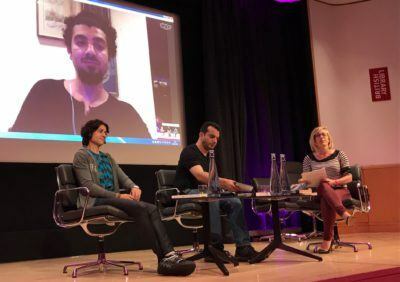 Among the participants was acclaimed Egyptian writer Mohammed Rabie, author of Otared, who was invited to talk in a panel discussion on “The Waking Nightmare: post-revolutionary Egyptian dystopias,” along side award-winning writer Basma Abdel Aziz and prominent artist Ganzeer (via Skype). Click here to read Leber’s complete article on Arablit’s blog. Listen to the whole panel on SoundCloud.